Japanese black ink stick, Sumi. My short trip to Nara was very good and comfortable because fabulous weather and the brilliant green leaves on the trees made me feel good. I’d visited to almost of famous temples in Nara city, but the last one I’ve never visited before was Shin-Yakushiji, which is famous for several Buddha statues designated National Treasures such as Yakushi-Nyorai and Juni-Shinsho: The twelve divine generals, So I’d been looking forward to seeing them. At the JR Nara station, when I looked for a map for tourists to Nara, I happened to get a free sightseeing guidebook of Nara city. I found an interesting photo on an ink stick, which was called Sumi in Japan, and I decided to go to the shop before visiting to Shin-Yakushiji. 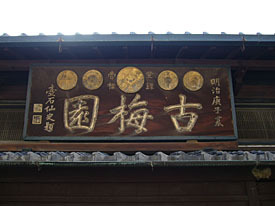 The shop’s name was Shoujudo “松寿堂” located in an old town. It took about ten minutes to go there from the station by foot. I hesitated to enter the shop for a while because its facade seemed to be an old-established and really high-toned, but the owner was very happy and welcomed to enter the shop. 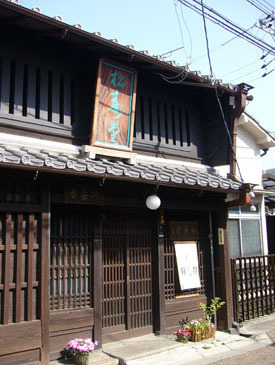 The inside of the shop was very beautiful and traditional Japanese style, there were many Japanese-traditional furnitures such as wooden step-like chest of drawers. The master showed me some products, which were the same ones on the guidebook, and explained how to make them. According to the master, the Sumi made in Nara is called Nara Sumi, which has been for more than 600 years since Muromachi period to provide for demand from the temples, mainly Kofuku-ji temple, in Nara area. 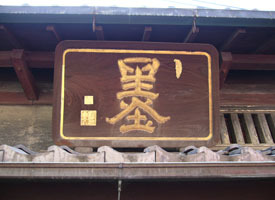 Shojudo has been making Nara Sumi scince 1865, Edo period, and designated as a royal warrant shop. 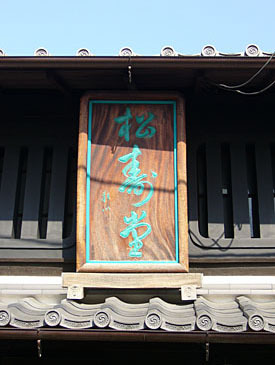 There were a few Sumi makers in this district a few years ago, but now, Shojudo is the only shop around there. 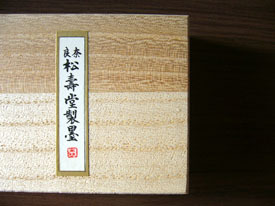 And then, he showed me a Sumigata, the decorative wooden molds made from Asian Nashi, Asian pear, used to form ink sticks. As I remembered that Prof. Hermann Zapf mentioned about a Japanese ink stick in the movie “The Art of Hermann Zapf”, I told him that I’ve heard some of Calligraphers not only East-Asian style but also European style used a Japanese Sumi as a black ink. Then I proposed him that he would introduce Sumi to Calligraphers who lives in Europe area. The master was very interested in this topic. 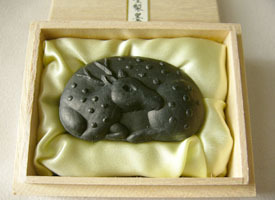 I bought two pieces of Sumi that shaped lovely Japanese deer, which lived in Nara Park and was considered sacred of Kasuga Taisha shrine, in a small box of paulownia wood. It was a pity that I didn’t have much time left to get until the Shin-yakushiji temple would be closed. I hoped I would like to visit again so that I could get enough time to chat with the master. 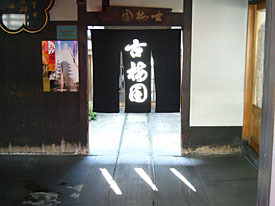 (Above) The wooden shop signages and “Noren: 暖簾”, which is a store curtain hanged on the shop entrance, read “古梅園: Kobaien”on another shop that I found out during return to the Nara station from Shin-Yakushuji temple. 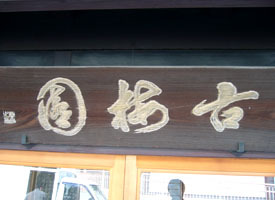 (Lower right) The letter “墨: Sumi”, which means ink stick.